Marcus Armstrong clocked the fastest time during free practice today, but Liam Lawson edged him off pole to set up a dual Kiwi front row for Saturday's 20 lap first race. Armstrong has set the fastest time of the weekend - a 1:23.468 in free practice. In qualifying he looked set to do the same until Lawson slipped in a 1:24.137 to lead. When Armstrong went to respond he was baulked at the chicane that launches the cars onto the front straight.Pole at Taupo is on the 'inside', away from the racing line and has to be treated with great car, being often coated in pumice dust and cast-off rubber. 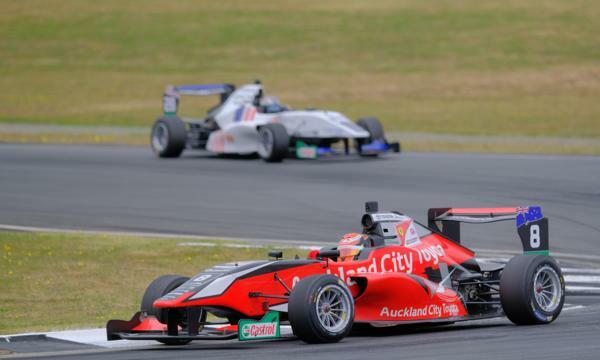 Qualifying sets up another epic race between the two Kiwis, with the leading internationals poised to take advantage of a slip from either driver.